Rooster, originally uploaded by Dzwjedziak. 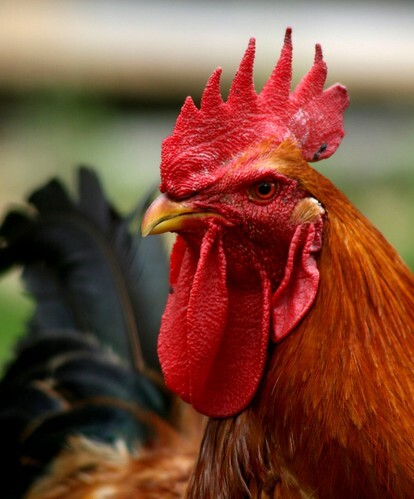 About a week ago we were awakened at 4:50 a.m. by… a rooster crow? Yes that is right. And it was repeated consistently for the rest of the day. It seems that a rogue rooster has attached itself to our neighbor’s chicken coop and nobody wants it. Luckily Ada seems immune to his calls which is good since she is sleeping very well until about 6:30 these days. Noah and I, however, are waking consistently at, that’s right, 4:50 a.m. Yesterday I seemed to be anticipating his calls and woke up at 4:30 just to make sure I didn’t miss a one. So, what do we do? Post a “Found Rooster” poster around town? Wait for a coyote to get him? Call animal control? Or something more creative? Average Rating: 4.6 out of 5 based on 154 user reviews. I love roosters. In Central America I loved hearing them crow in the early dark hours of the morning. Hearing them crow brings back all the good feelings of being in a country village. That is the best picture of a rooster I have ever seen.